While we think of God, we think of Justice. Justice and righteousness is something we consider as inherent in the Idea of god. We see a great deal of injustice around in the world and when we are unable to explain and rationalize the same, we lean on the idea of God. Man is a rational animal, his being is an exercise to understand the world around him, the plight to understand and explain things around him is his raison d'etre for a Man. Man tries to understand the world around him and tries to arrange it in a cycle of imaginary Cause and Effect. Anything which he is unable to understand and therefore, explain, causes discomfiture, and he failing to find any reason to assign to an event, and unable to bear to cruelty of truth in the brutal hopelessness in the words of Somerset Maugham when he says, The rain fell alike upon the just and upon the unjust, and for nothing was there a why and a wherefore. assigns all that is inexplicable to an entity called God. The idea of God has survived through the long and tedious journey of human existence because it makes life bearable. This also tries to answer the beginning and end of the world or universe as we know it. It converts the vector of evolution into an eclipse or circle with no begining and end, moving across with God as the central Idea. Higgs Boson tries to answer that in a different way. It puts an unthinking, non-judgemental particle at the start of the journey of the universe, instead of a benevolent, father figure which we call God. God which did not die with Nietzsche's shocking proclamation," God is dead" does not die with this proclamation either that God is a particle, which is nothing more than "is", which neither judges, nor comforts nor cares nor loves. This is a slippery ground on which I walk on, being what the nerdy scientist on "The Big Bang Theory" terms as a mere engineer, that too not an outstanding one, as I try to put perspective of what Higgs Boson is, borrowing heavily on those who understand it better. I do it not to impart some great knowledge which is my own, but merely because of my own selfish interest of trying to understand what actually it is, through the process of writing it (since when I was a child, I was always told best way to understand something is to write it on a paper). The Bosons are building block of Standard Model of Particle Physics, deriving its name from Indian scientist Sh. Satyendra Nath Bose (Do I see a gleeful smile from Arunab Goswami of Times Now, at the mention of the word Indian, though in my view, people of such great stature transcends the small and confining national boundaries and territorial intentions of people looking for bounced off greatness), a name coined by Physicist Paul Dirac. Standard Model of Physics describes the fundamental particles and how they interact with fundamental forces of nature, namely Strong Nuclear, Weak Nuclear and electromagentic (leaving out Gravity, which is fourth fundamental force). The nucleus of the matter is built out of quarks which forms composite particles called hardron (Proton and Neutron). What we all studied through our higher secondary classes, fighting drowsiness and feeble understanding, is some nucleus in the center of matter with Proton and Neutron housed in it and electrons running around in their respective orbits around it like teenagers in love around trees in Hindi movies. While trying to get a grips of Higgs Boson, first time I stumbled on brilliant lecture by Prof. Richard Feynman, which for the second time made me regret not having taken science as seriously as it ought to be, first time was when I watched "The Beautiful Mind" and was particularly touched by the scene when all the colleagues place their pens as an acknowledgement to the genius of aging professor. 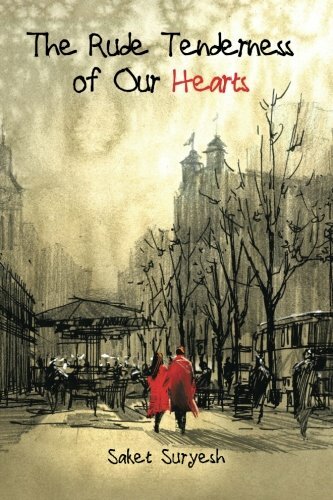 When hearing the wonderful professor, who shredded off the clothes of empirical formula beneath which naked beauty of chemistry hid, and merged with particle physics, I for the first time wondered about the curious point as to what could be keeping all those protons, all similarly charged positive, together, after all even a layman knows, Opposites attract. The good professor explains that while on the surface of it, protons carry same charge therefore must repulse, in the base of it, they are made of something called quarks (proposed in 1964 by Murray Gell-Mann and George Zweig, a term they stumbled on in James Joyce writing Finnegans Wake) which are differently colored and this difference in color (in terms of Quantum Chromodynamics) which is not actually color (Quarks actually come as six flavors with interesting names, up, down, strange, charm, bottom and top, Proton being formed out of UUD (Up, up, Down) and Neutron being formed out of UDD(UP, Down, Down) )as we know it (what it actually is, I do not know and care about, since knowing it to be of different color is good enough to explain my confusion, is what makes them stay glued together with ...well...Gluons, no prizes for getting it right. I really do wish instead of meddling with the admission procedure of IITs which seems more like Mayavati's elephant statues, built only to create memorials for posterity to remember them by, our dear education minister would do well to watch that lecture on www.vega.org.uk and see how better we can train our school educator and get our kids the benefits of such wonderful perspective in schools. No law can replace the good that a teacher can do to the kids, hope someone listens to so many scientists and researchers, forgoing an interesting career for the lack of inspiration, but that is another story. Glouns hold together the protons with what is termed as strong force of attraction, termed thus because it is well, stronger than other forces (100 times that of Elecromagnetic Force, and about 10 39 times that of gravitation force), and what is truly amazing is that unlike other forces this force is not a function of distance and after a distance it remains unchanged. Broadly, particle can be divided into two classes based on the type of interaction they can have, ones which can have strong interactions like your old college mates termed as baryons (formed of Quarks six as mentioned above) (like Protons (UUD) and Neutrons (UDD)), formed out of three quarks and those who can not like your work colleagues (well mostly) called Leptons (includes electrons, Muons, Tau with electron Neutrino, Muon Neutrino and Tau Neutrino etc.) . This is very captivating story, explaining what we thought as exception by bringing new dimensions (for instances, spin into two electrons in same orbit, thus explaining what we thought as exception to Pauli's exclusion principle which posits that no two particles can occupy same time and space (except for with different spin) and how any additional electron brings about electricity with loose electron wandering around for a house of its own, unloved and forlorn. Well, confining to the subject, Bosons (photons and Mesons following Bose Einstein Statistics) are exclusion to Pauli's exclusion in the regard that two Bosons can occupy same space being force unlike Fermions (latter including all quarks and Leptons following Fermi-Dirac statistics). 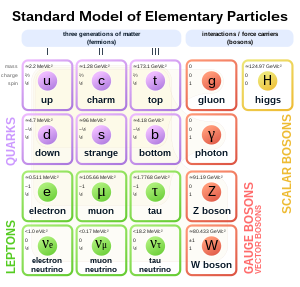 There are five Bosons, four of them being gauge bosons, Photons, W and Z bosons and Gluons or force carrier (Photon for Electromagnetic Field, W and Z mediating weak force and Gluons underlying strong force). Higgs Boson is fifth Boson, which gives other particles mass, named after Peter Higgs, whose theory called Higgs Mechanism predicted this particle, in 1964, eventually corroborated through a massive experiment, beyond my limited comprehension, few days back, 5th of July, this year. The LHC (Large Hadron Collider) with its sophisticated accelerator was launched in 2008, by CERN, to search for the elusive Higgs Boson by colliding Protons. In simple terms, Higgs Boson is force carrier which makes the particle around gravitate (regrettably, scientifically wrong term) towards itself thus giving rise to mass from force. The amount of mass which any particle gains depends on how it interacts with Higgs Boson. Photons, for instance do not interact with Higgs Boson and gain no mass, while quarks strongly do and therefore gain mass. Thus, the existence of matter hanged on how a particle interacted with Higgs Boson, latter thus being primary requirement for the formation of mass. Without Higgs Boson, every thing will be light like photon, and nothing will gain mass and form composite particle like Protons and Neutrons. Higgs Boson makes the particles massive, making them heavier, slowing them down for them to be able to latch on to electrons thus forming atom. Thus being the prime lever to the start of the universe from an atom, Higgs boson was given the name of "God Particle" much to the dislike of Peter Higgs, himself being atheist, who publicly wondered if this name is likely to offend people who are religious. What we term as particle is in real sense could be particle in real sense or could be field. Higgs Boson converts the particles which are field in layman term into particle in the layman terms. This implies after the Big bang as the universe cooled down a field existence which was helped by Higgs Boson to gain mass and thus start the universe. Higgs field came into being immediately the universe came into being, slowing down particles (mass-less at the time) making them gain mass.While that disappoints the romantics and religious, as the world would be seriously disappointing and boring if everything could be scientifically explicable, it explains the begining of the world (may be not that bad, who put that Higgs Field in place, so that the universe may commence?). What differentiates Higgs field from all other energy fields is its pervasiveness an ubiquity irrespective of availability of the source of charge, rendering hypothetical God like character to it. While the term God particle could be saddening to our rationalizing minds trying to rationalize the world around us and find a sense of justice in abrupt happenings around, it would be appropriate and pleasing to senses to term it God's particle, instead.